My last post gave you my top tips on using the radio in caregiving. The radio is vital because it’s free, familiar, and relatively easy to operate. These days, though, technological advances have given us the luxury of many more ways to access great music. Those alternate routes to musical discovery are what I’m highlighting in this post. Of course, one big caveat is that computer-based music sources may be totally foreign to the people you care for. YOU obviously know how to get on the internet well enough to find this post, but the people you care for may be much more intimidated by that. I’ll cover tips for handling that below, too. 1. Try TV music channels. Many cable providers provide something like Music Choice channels, each of which offers a continuous stream of music from a particular genre or style. These are great to turn on for residents in assisted living or long-term care facilities as an alternative to using other TV shows for background noise. In Kansas City, on Time Warner Cable, check out channels 901-946, especially 938 – Swingers and Swing and 940 – Classical Masterpieces. These are like radio with minimal commercials and pretty pictures and trivia questions to boot. This is the speaker system I use. You can click the photo to buy it from Amazon. Music player. This is an iPod, mp3 player, or computer. You may even already have an old laptop or iPod lying around somewhere. You’ll want an iPod or mp3 player for playing recorded music. The computer can play recorded music, too, and will also enable your care receiver to access sources on the internet. Speakers or headphones. There are tons of options available – too many to list here. Consider cost, size, shape and sound quality, and know that you can spend as little as $10 to get music to your loved one, although you may sacrifice volume or sound quality. Choose speakers so more than one person can hear the music (like when you want to listen together with your loved one!) and for comfort when the care receiver is sitting in their favorite chair or lying in bed. Choose headphones for portability or if your loved one has hearing loss that requires listening to speakers at a volume that disturbs the people around them. Auxiliary cable to connect the music player to the speakers or stereo system. These are cheap – less than $5 – and are available at places like Radio Shack and Target. You may need this to connect your music player to the speakers, or it may be included with the purchase of your speakers. 4. Try internet radio. If your care receiver has internet access, sites like AccuRadio and Pandora can provide a seemingly endless variety of music from any genre. In a residential facility? Just ask whether wifi is available for residents. My dad managed to access internet radio on a laptop computer during a stay on a skilled nursing unit – he just had to ask. 5. Leave operating instructions. These should be clear enough for your loved one and for any other caregivers to follow. Draw a picture or leave a photo of how the setup should look to be operable. You’ll also want to label the appropriate buttons to push. 6. Automate when possible. If you’re leaving a laptop, for example, adjust the settings so iTunes opens automatically when you open the laptop. 7. Recruit technologically-minded allies. Maybe it’s that teenage grandson who doesn’t know what to say when you visit grandma, or maybe it’s that CNA with the jet-black hair and the weird earrings. They probably know how to work an iPod and a computer and could help your loved one figure it out when you’re not there. 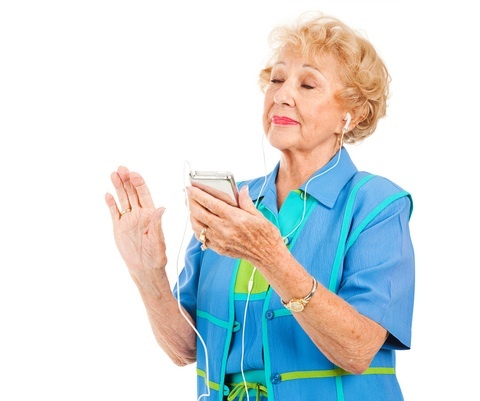 As a bonus, helping with the technological side of getting the music to play may be a way for the older person and the younger person to build some rapport. I’d love to hear how you’ve helped your clients or loved ones access music using means other than the radio. What has been successful? What has been challenging? Leave your comments below! iPods vs. Music Therapy: Is There Room for Both?